Can a volleyball bar change Houston? - Archpaper.com Can a volleyball bar change Houston? 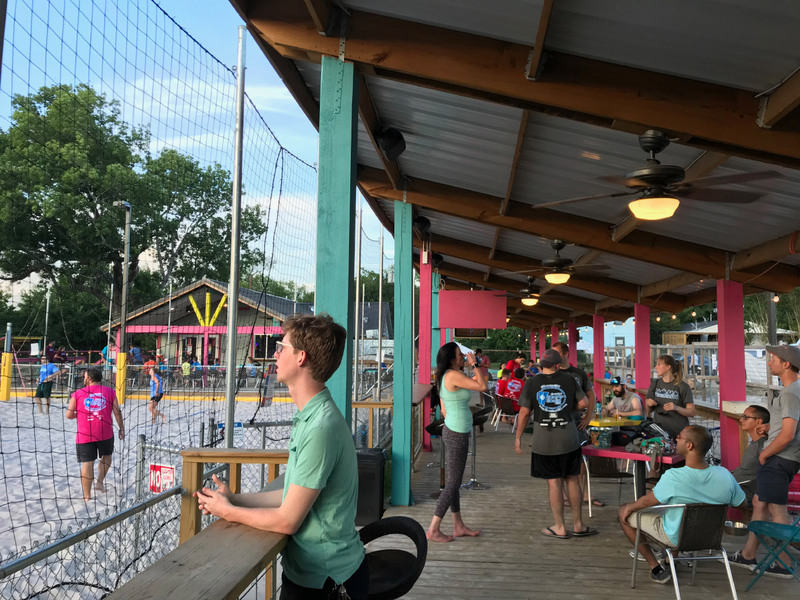 Can a volleyball bar change Houston? Houston is a city that revels in the intersection of event and space—it certainly has an abundance of both. 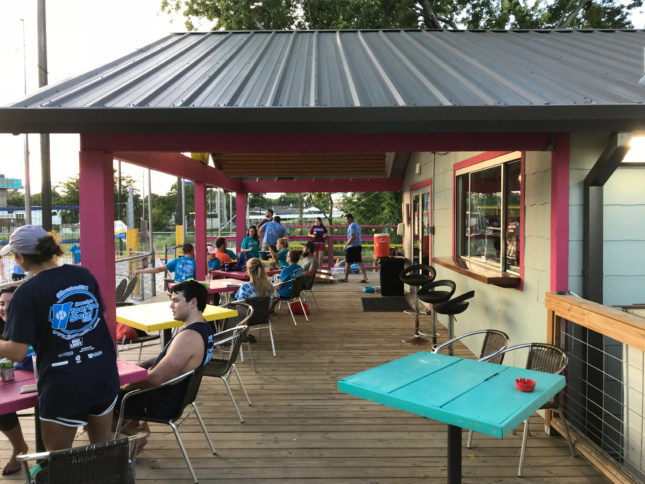 Adjacent to one of Houston’s meandering and often overflowing bayous in what was once an empty lot turned parking lot, Sideout Volleybar responds to the city’s social pressures and urban conditions. 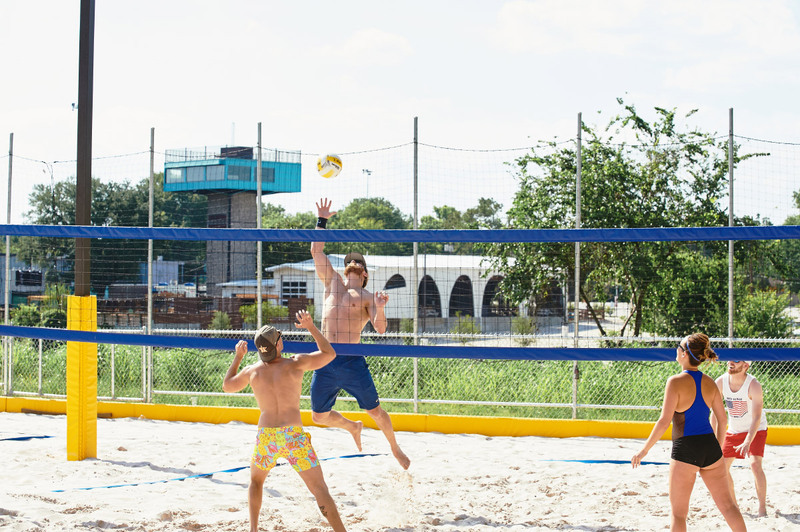 This volleyball social club opened in the Northside neighborhood in June 2017 and combines casual sports, bright lights, and beer. AN contributor Jack Murphy and I decided to do a bit of participant observation on a recent Wednesday and headed over for burgers and beer. Sideout has three courts lined on two sides by a covered observation porch along with a bar house, a bean bag toss court, a dog area, and a food truck parked outside. “It’s like an athletic Ice House,” Jack observed, referring to the open-air beer joints that have long dotted the city. This particular evening was both a trivia night and a league night, so the jarring patter of trivia questions layered over the chatter of various teams on the courts, all atop the soundtrack of greatest hits from the early 1990’s. The music of 311 was on heavy rotation. It was a ball. Sideout is a bar for beach volleyball and this seemed simple enough. The venue calls itself a “volleybar,” but the place is alive with activity: What we discovered was a veritable volleybar ball. “I think we are in the 1 percent of people not wearing an obnoxious league shirt,” Jack comments. The team players wear generic loose-fitting league T-shirts, distributed by Houston Sports & Social Club. For expediency, the graphics on every shirt are the same, so the 20-odd teams are differentiated by a range of colors that evokes a middle-school summer day camp. What is illustrative to the architect in this situation is that what is happening is really an event-based urban choreography. Houston is a city of unparalleled diversity with very few circumstances that allow for the public to appear together—but here, people come in droves. By our rough count, there must have been nearly 200 players at any given time in the complex: trivia sharks, volleyball players, dog-walkers, and even a few just plain barflies. I can’t help but imagine the league T-shirts as some type of Situationist uniform à la Constant’s Homo Ludens. Will Thomas, one of Sideout’s owners and a local musician, cited many of the Tex-Mex establishments of his youth and their “organic informality” as his inspiration for the place. Thomas is a partner in W2 Development, a company responsible for many of the recent commercial developments in the neighborhood. Nearby, there is a new metro light rail stop, the White Oak Music Hall, designed by Schaum/Shieh, a dramatic bridge over a river (a bayou, upscaled), and a hike and bike trail in the works, all set in a loose assemblage that doesn’t quite amount to an urban system until you see it activated through its events. Whether it’s an outdoor concert, a cinema screening, or, of course, league night at the Volleybar, each time you visit, you might find yourself in what feels like a different city. If you don’t mind the sartorial constraints of the league T-shirt and would enjoy the feeling of standing at the center of a sociality you can’t quite perceive the edges of, then come over to the Sideout Volleybar. If bumping, setting, or spiking isn’t your thing, then at least you will find a unique place to imbibe and watch the sun set against the Houston skyline.